"Robust," the unlikely new leader in health reform buzzwords. Robust, the unlikely new leader in health reform buzzwords. Suddenly, we have a new front-runner in the health reform catchphrase sweepstakes. “Bending the curve,” the early favorite, is fading fast. In a “clarifying letter” last week, Congressional Budget Office Director Doug Elmendorf asked the existential questions “Which curve?” and “What does it mean to ‘bend the curve’?”—pointing out that the budget world is a boundless universe of different curves that can bend in different directions at different times. After an impressive start, the late-summer entry “death panel” also fizzled when reassuring news of its nonexistence inspired a nationwide Emily Litella moment. Robust, by contrast, has been on a roll. Few terms have climbed the charts faster or in more improbable fashion. A Google search for “robust public option” (RPO) turns up 2.2 million results, outpacing “bend the curve” (1,170,000), “pre-existing conditions” (896,000), and, most remarkably of all, “universal health care” (2,080,000). If the debate goes on much longer, “death panel” (2,790,000) had better watch its back. That’s a heady rise for an unlikely word. Robust comes from the Latin robustus, or oaken. Like oaken, robust owes its impact to the relative rarity of its use. On the Wiktionary list of the most frequently used words in the English language, robust ranks 8,791st—just ahead of Belgian and withstand. Wiktionary clocks its frequency at about one appearance per 190,000 words. And that’s its ranking in books; in TV and movie scripts, robust comes in 22,335th. Outside policy circles, option is also uncommon, appearing about once per 380,000 words and finishing 11,744th, right after flap and just ahead of Idaho. In spite of the inherently popular word public (302nd place, at one use per 3,600), the obscurity of robust and option makes RPO a far greater statistical improbability than it ever was a legislative one. If, like the great indie band Neutral Milk Hotel, health care policies were named by assigning random words in no apparent order, the combined probability of coining the phrase ” ‘robust’ public option” would be something like one in 260 trillion. No such luck: This past week, RPO was everywhere—from TPM to Fox to the Hill. When I plugged the Roll Call Web site into Wordle.net’s cool word-cloud generator, all three words made it big. While not exactly poetry, RPO has a certain rhythm. In Washington, ” ‘robust’ public option” is what passes for trochaic trimeter. The word robust has a rich array of meanings—”strong, rough, full-bodied, hearty,” and this priceless definition from Merriam-Webster: “of, relating to, resembling, or being a relatively large, heavyset australopithecine,” an extinct ape a few million years before us on the evolutionary ladder. In politics, where syllables come two-for-one, robust is another way of saying strong. What makes ” ‘robust’ public option” so conspicuous, however, is that snobs and ad writers commandeered robust long before health reform. 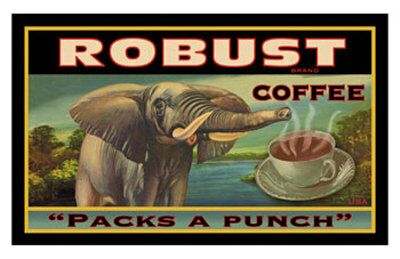 Until recently, robust turned up primarily in coffee ads, wine boasts, cigarette packaging, and sketchy promises of “robust earnings growth“—in short, not the best company for a health care public option to keep. Ad agencies use words like robust because the rest of us don’t, and in the process they make them sound suspect and precious—especially when “robust” products prove as oaken as Starbucks’ undrinkable Pike Place Roast and Camel’s Robust Signature blend. That was 10 years ago. Now the robust epidemic has roared back stronger than ever, overwhelming stalwart first responders. For the moment, the terms of the public-option debate seem to have narrowed to wonky, workmanlike phrases—opt-out, opt-in, trigger—none of which will ever turn up in wine reviews or win a Joseph Heller Memorial Cliché Contest. Just in case RPO should stage another comeback, however, here’s a fine list of compelling alternatives—muscular, powerful, sound, thriving—that attempt to capture the R-word’s meaning. My favorite is robustious, which traces back to Hamlet’s ridicule of “a robustious, periwig-pated fellow.” With clichés like that, cable might be worth watching.